When I saw the opposition walk out during the president’s address today, I expected it to be over something substantial. As I listened to the president’s speech, though, I couldn’t figure out which part exactly these politicians objected to so much that they had to get up and leave. Chaudhry Nisar says they walk out was staged because the government hasn’t been moving fast enough, and the opposition politicians felt that they didn’t even need to listen to the president and so they just walked out as a symbolic protest. But what is the point of such a gesture? Had Chaudhry Nisar read the speech before the president spoke it? How could he know that the president would not address the grave issues of the nation? Obviously not, because the president did address the grave issues and asked for dialogue and consensus between all the parties to find solutions. President Zardari clearly does not believe that we are in an all okay situation. He has seen two of his dear friends murdered in the first months of the year. To accuse him of ignoring reality is simply beyond the pale, especially when it is accused by political leaders who do not have the respect to sit and watch the president of the nation speak for a few minutes. What really bothers me, though, is that I must ask what speech would have possibly made Chaudhry Nisar happy? Should Zardari say that the country is in ruin and everything is terrible? Why can’t we ever be proud of anything? Is it too much to ask to allow the people to be proud of their country for twenty minutes once a year? Why does Chaudhry Nisar have to spoil this? Even his complaints about lack of progress are missing the point. Chaudhry complains that tax has been imposed through ordinance and not through parliament, but even Maleeha Lodhi admits that there was no other way to do what was necessary because opposition politicians like Chaudhry Nisar are playing politics games with the nation’s economy and refuse to make the difficult decisions required to put the nation on track. Should tax be imposed by ordinance? No. But why Chauhdry Nisar cannot show the leadership to work with the government to do what needs to be done to build the economy up instead of putting it down? What is really disappointing, though, is when Chaudhry Nisar has the complete lack of shame to bring up Raymond Davis and play to the gallery of Ghairat Brigade! He says we should know who made the decision to release Raymond Davis. He should ask his good friend Shahbaz Sharif for the answer! He asks where the blood money was paid from. He should ask his boss Mian Nawaz Sharif about his friends in Saudi Arabia where the blood money was paid from! Of course, Chaudhry Nisar knows all of this already. He is only saying these things to play politics. He says that his walk out has given a positive message to the masses. That’s ridiculous. He is so consumed with his own political ambitions that he refuses to admit that anything good could possibly happen in Pakistan if PML-N is not at the helm. So why doesn’t he show that PML-N has some solutions rather than saying “no” to everything proposed and then putting down the nation over and again as a disaster? Why doesn’t he show that that he can engage in dialogue and build consensus rather than walking out of the room like a spoiled child? When politicians devise strategies, the goal should be to move the country forward, not to move their own careers forward. 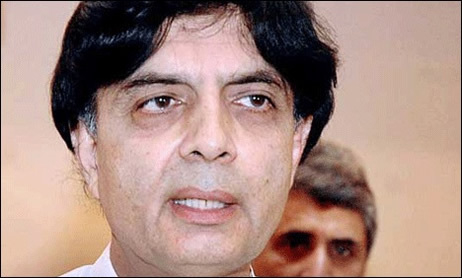 Chaudhry Nisar and PML-N have some good ideas and they can contribute to making the country safer, more secure, and more prosperous for everybody. But they can only do this if they are participating in the process, not throwing wrenches in the works and spoiling the cream for everyone else. I could not help but shake my head as the president neared the conclusion of what was a pretty good speech by inviting all political parties for a national dialogue. The 18th and 19th amendments prove that when the politicians put the good of the country before the good of their personal ambitions, the nation can move forward. But dialogue and consensus requires listening. And you can’t do that if you’re walking out to score cheap political points. This entry was posted in Blogs and tagged 2011, Chaudhry Nisar, national assembly, opposition, pml-n, politics, speech, zadari by Mahmood Adeel. Bookmark the permalink. Am I missing something that the emperor showed his court in his new clothes that made some blush and walk away! You are not missing anything I think. But let us be realistic. What leader of what nation will make a national address and say, “Everything is terrible and my government is not doing enough to make things better”? You yourself have chastised me for injecting too much venom, and you are correct that sometimes I forget to consider the positive. I do think that it is important to point out the good that has occurred over the past few years, even if there is a lot of bad that also occurred, simply because we need to be able to hold our heads high and know that there is hope. Especially leading into today’s commemorations, I think the speech was pretty good.